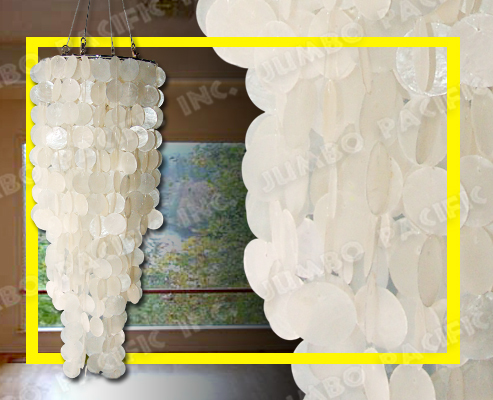 Chrome Plated metal frame Capiz Chandelier made of Philippine capiz shell chip components best for your kids room, teenager living room or young children for making there room a wonderful creative customized lighting ceiling decoration. Click here for chandelier in wooden frames. 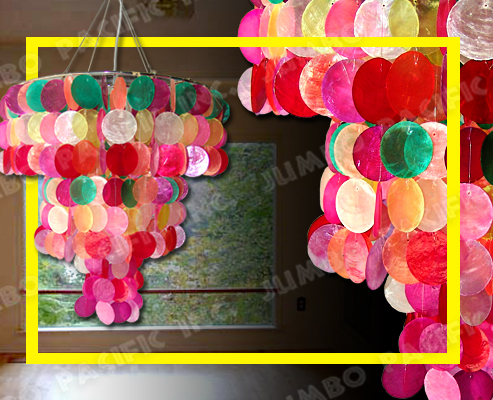 | Click here for jumbo size chandelier. 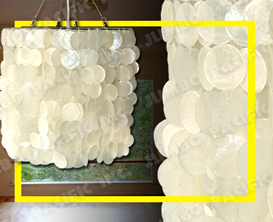 DESCRIPTION: Capiz chips natural white in circle design. Height: 12 inches base to bottom. Diameter: 8.5 inches. Chips quantity: 371 pcs. 50mm capiz chips round shape. DESCRIPTION: apiz chips in yellow, green, red and white circle design. Height: 48 inches base to bottom. Diameter: 16 inches. Chips quantity: 85 strand, 2210 pcs. capiz chips round shape. 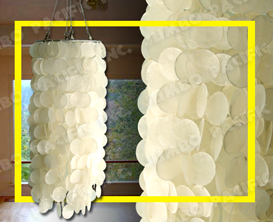 DESCRIPTION: Capiz chips natural white in round design. Height: 22 inches base to bottom. Diameter: 8.5 inches. Chips quantity: 50 stand, 550 pcs. capiz chips round shape. 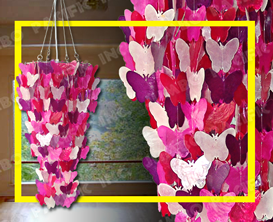 DESCRIPTION: 3 layers Capiz chips in pink, red, violet and white butterfly design. Height: 18 inches base to bottom. Diameter: 8.5 inches. Chips quantity: 53 strand, 372 pcs. 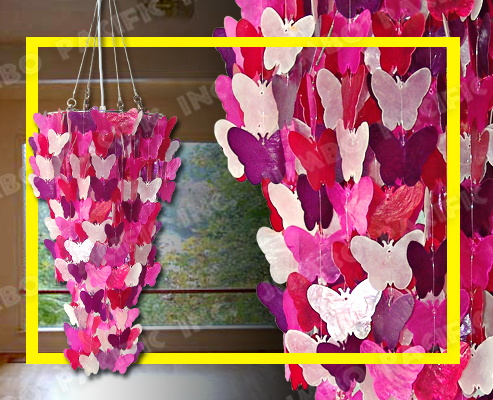 50mm capiz chips butterfly shape. 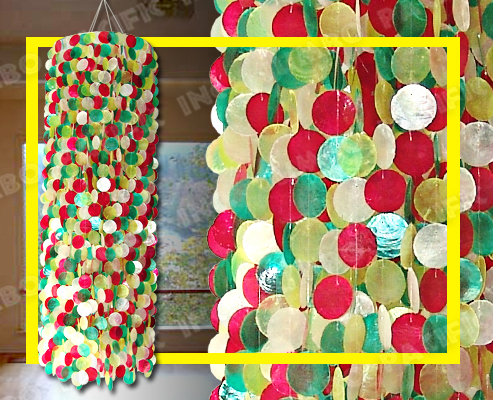 DESCRIPTION: 3 layers Capiz chips in green, orange, pink, red, yellow and violet circle design. Height: 17.5 inches base to bottom. Diameter: 16 inches. 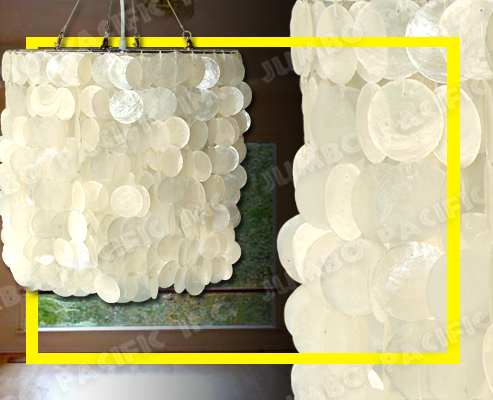 Chips quantity: 93 strand, 441 pcs. 50mm capiz chips round shape. 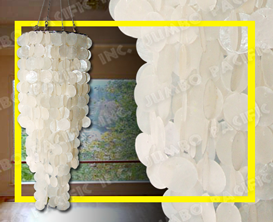 DESCRIPTION: 3 layers Capiz chips natural white in round design. Height: 25 inches base to bottom. Diameter: 8.5 inches. Chips quantity: 54 strand, 600 pcs. 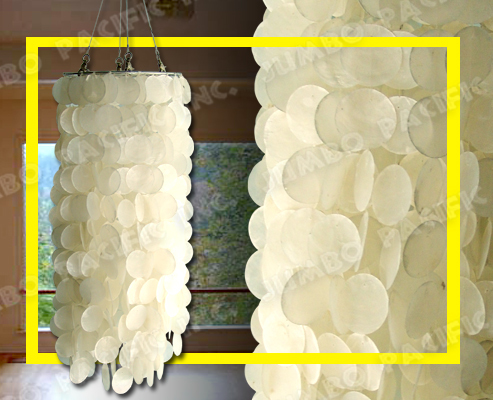 50mm capiz chips round shape.